Would you like to recover more and pay less? 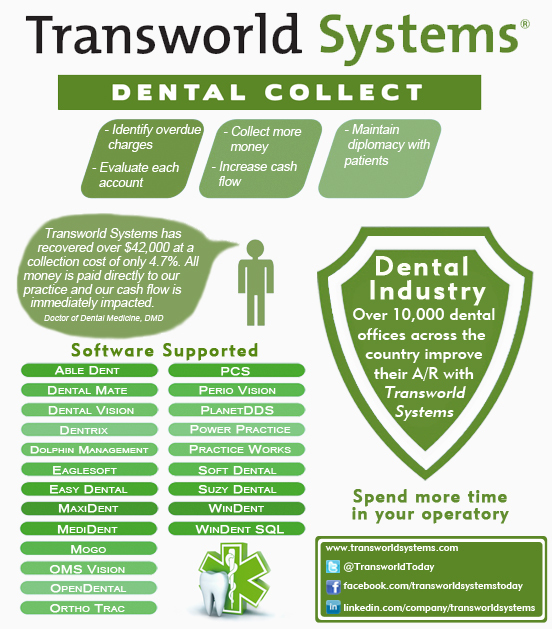 Dental Collections does not have to be difficult. Dental Collect integrates seamlessly with your practice management system (PMS), and helps dental practices increase overall cash flow while saving time and maintaining patient diplomacy. Because of products like Accelerator, Dental Collect and Profit Recovery, the dental industry can have a healthier bottom line and better cash flow, which improves the office accounts receivable.